In the early stages of planning, I cut out a clipping of vows that I liked from a magazine…can’t remember which, remember I own over thirty five wedding magazines. It’s in one of them! Then The Mister came home from work one day and someone was talking about their vows…and ours were crazily similar. He was talking to a Hindu dude and these are the vows that they say. If you click on the link, you’ll see that my hackles were probably raised a bit by the first vow…but the style, the back and forth, and even the sentiment of the remaining vows were the same. So we’ll come up with some that reflect who we are without being too weird. Heidi: Not to talk when you are driving and we are lost. Nigam: To help you find your glasses when you can’t see. Heidi: To make everyday a fresh start. Nigam: To dance on command like a trained monkey to the theme music for House. Nigam: To try to see things from your point of view. Heidi: To support you in whatever you choose to do. Nigam: To support you in whatever you choose to do. Heidi: To try to see the big picture. Nigam: To try to focus on the details. Heidi: To stand by you. Nigam: To pick you up whenever you fall. Heidi: To lean on you when I need help. Nigam: To ask you for help. Heidi: There is nothing you can’t tell me. Nigam: I promise to let you in. Heidi: To grow with you. Nigam: To do something special for you everyday. Heidi: To try not to hold grudges. Nigam: To watch craptastic movies with you. Heidi: I promise to love you. 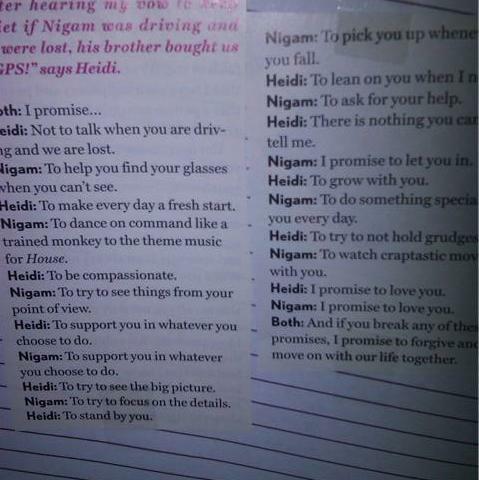 Nigam: I promise to love you. Both: And if you break any of these promises, I promise to forgive you and move on with our life together. I really like the idea of these, the conversational tone, the promises to each other. I think we’ll probably pass on the jokey stuff and stick with the sappy, sentimental stuff though. Have you thought about vows? Are you going traditional or writing your own? I’ve heard bad stories of TMI with folks who write their own, so I’m trying to be cognizant of that as we think about writing ours.